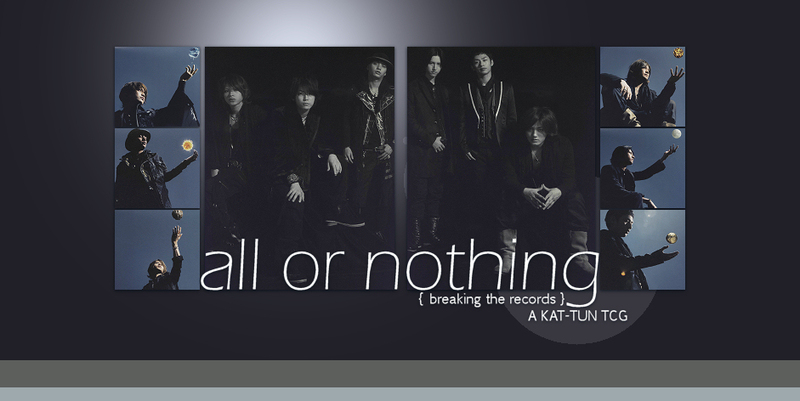 ALL or NOTHING is a KAT-TUN TCG that was started on June 27 by Satsuki and Mi-chan. KAT-TUN opened for prejoin before becoming a full-fledge TCG on October 6. The name for ALL or NOTHING comes from the lyrics of the song, "GOLD" (and should not be confused with a similar title from the boyband, Arashi). Satsuki is a pre-/post-debut fan of KAT-TUN, and has been a fan since 2001. Her favourite members are Taguchi Junnosuke and Akanishi Jin, and has admiration for Ueda Tatsuya for his lyric and composition skills. Satsuki used to be co-owner of FROOTS and was owner of Amuse. Mi-chan has been a fan of KAT-TUN since 2006. Her favourite member is Ueda Tatsuya, and also likes Nakamaru Yuuichi. Mi-chan is also a staff member of several other TCGs such as Countdown and 5x5.